Home Lambert Lambert’s Signings Report: Success or Failures? Lambert’s Signings Report: Success or Failures? With the opening of the January transfer window weeks away, we analyse the impact and success of Paul Lambert’s signings from the summer. Lambert has often referred to his recruitment policy as targeting “Young hungry players”, but has he been shrewd in his under-the-radar captures? Without question “The Beast” has grabbed most of the headlines out of the new recruits, and has taken very little time in settling into English football. His power, strength and ability is often a stereotypical way of viewing somebody of Christian’s size and physique, but he is technically very good on the floor as well and possesses great vision. Up to now we have not really seen him with a regular strike partner, being as Agbonlahor is used out wide a lot, but has demonstrated great ability into holding on to the ball and linking the game up, most notably against the two Manchester clubs, and has had a hand in almost every goal we have scored when he has been on the pitch since his arrival. Brilliant business, great acquisition and keep him fit and happy, then his success story here at Aston Villa could rank up there with some of the greats of recent years. Big Success and at a bargain price! Summary: A slow start to his Aston Villa career, as following his debut in a 2-0 home victory against Swansea, the substitution appearance away at Southampton will not be remembered fondly by the new signing from Crewe, and we did not see him in action then for six games until his return against Sunderland, and has not looked back since. Westwood has shown great composure on the ball with the ability to pick a pass. Westwood displays the ability what the modern day coaching system is attempting to coach into the young players, technically very good, with a good passing range. If the lad keeps progressing the way he has he could be a huge success at Villa, as we have in my opinion only seen a glimpse of what he can do, and once we have a settled formation and maybe one or two consistent players in midfield with him, his ability to control a game will really begin to show. A good strong ball winning player alongside him could really give him the freedom to get forward and maybe add goals to his game. Definitely a good recruit and will go from strength to strength. Verdict: Promising and showing early signs of success. Summary: The versatility Matthew Lowton has shown since his arrival has been superb, with the ability to play at either full back position, or filling in admirably at centre back. What has impressed me most up until now with Lowton is his ability to stop crosses into the box and a decent turn of speed. A goal scoring start to his career with a brilliant volley against Swansea, and has displayed a great engine to get forward. Of course we will compare him to Alan Hutton so of course he is going to be an improvement, but with a bit of work both defensively and offensively he could go on to be a great signing for the club. Maybe we were spoilt in having Kyle Walker here for half a season, but I would like to see Lowton produce a bit more in the final third when he does get forward. A steady start. Verdict: 7 out of 10 week in, week out, steady but not spectacular. Improvement on what we had previously. Summary: An instant hit with the Villa fans, and has shown heart, desire, leadership and passion. The Lambert approach has been very different from the approach from the Alex McLeish and Martin O’Neill approach, so the days of big rugged defenders looking for the long ball at every opportunity appear to be gone, and it has been long overdue. Lets hope Vlaar can add goals to his game as his size and power is a real handful at set pieces. Verdict: Success and a massive bargain! Instant fans favourite. 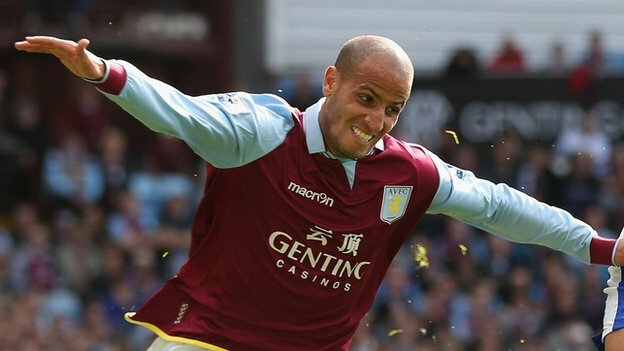 Summary: A mixed start for Karim El Ahmadi to his Villa career. The man has unquestionable quality and is technically very good and an on form El Ahmadi is the sort of player we need. Unfortunately we have only seen a glimpse of what he can do and despite a positive start with impressive performances in the first month, his form has dipped and has found himself in and out of the side. The problem we have faced in my opinion is the fact that El Ahmadi and Fabian Delph are very similar players, and too often this season have been in the same side, which has really not worked and there has been a notable difference in performances when they are not in the same side. El Ahmadi is a very tidy player whose game resolves around winning the ball and looking to pick the right pass, so it is imperative for him to be a success that the midfield players with him are creative players ahead of him. Verdict: Jury still out. Definitely capable, but inconsistent up to now! Summary: A frustrating start to Joe Bennett’s career at Aston Villa and we can only hope there is more to come. A poor performance which resulted in a needless red card against Norwich which could have cost us two valuable points, and seemingly the after effects of his knee injury away at Spurs have affected him and prevented him from completing even half a game on two occasions. A young player coming to a new club, a step above the level he was playing at previously is always going to find it difficult if he cannot get a consistent run in the side and hopefully we will see a fully fit Joe Bennett reclaim his place at left back as personally I don’t believe Erik Lichaj is good enough. Bennett has shown he as a decent engine and is very forward thinking, looking to get up on the overlap as often as he can, but appears to be struggling with confidence up to this point which is understandable. Verdict: Needs to improve! Faced a few difficult start, some of it self-inflicted and some has been unfortunate, but needs to do better. Although this was an Alex McLeish signing at the back-end of last season, it is important to acknowledge the contribution of the Australian. Operating as a wide player and off the striker much of his career, we have seen him operate in a number of positions. Holman has a great engine and his work ethic is phenomenal, pressing opposition players, hurrying them in possession forcing errors. Those that have seen Holman play before his arrival at Aston Villa will already know he has an eye for goal and spectacular ones at that. For all his industry and eye for goal, I have been a little bit frustrated with Brett Holman, as this is his chance to cement his place in the side as a player who can dominate games and open up defences, similar to what we expect of Stephen Ireland. Unfortunately Holman has not done that as often as we would like. It is fair to say that we need to give him time and if we can give him a regular run in the side, we will hopefully see the best of him. Up to now he’s flattered to deceive, with his quality in the final third distinctly lacking until the Arsenal game. But after that substitution appearance and a good first half against QPR, he looks promising and he’ll hopefully develop into a player we cannot leave out. We need his quality in the final third for 90 minutes, not 30 to 45 minutes which we are currently getting. Success, and still feel we are still to see the best of him. Lets hope we can strengthen in January and add the quality in the right areas to make this season a success. Unquestionably we need extra quality and experience in certain areas. Leave your thoughts on the signings above and the ones Villa need to make in the comments below. UTV. Agree with most of this, but for me, El Ahmadi doesn’t have what it takes to play centre mid in the prem. Technically, he is adept, but he isn’t physical enough and fades out of games. He doesn’t seem to have adjusted to the pace properly yet either, but that should come with time…IF, and it is a big IF, he can get back in the side. I don’t think he gives us anything that Makoun couldn’t offer to be honest. I’m not convinced with Holman either – great grafter, but does he really have the quality on the ball we need? Impact sub might be the best option, but you’re right that we need to give him more time.